With only a few weeks remaining before the release of their debut album, Animal Youth has released yet another hardboiled post-punk single steeped in romantic milieu and gothic intrigue. The rafter-reaching track, titled “Sunday”, can be streamed now via New Noise. 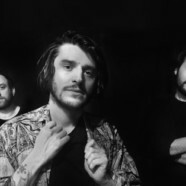 Shepherded by vocalist/guitarist Guy Tournay’s bleeding heart croon, the track epitomizes Animal Youth’s penchant for smoke filled riffs, brisk breakneck backbeats, and delightfully misanthropic lyrical bite. Sticking to the band’s “Stay Romantic” artistic credo, “Sunday” taps the emotional wellspring of withering love with an air of unflappable cool. The Brussels-based trio, which was sculpted from the remains of noise-punk group Siamese Queens, take cues from the Cocteau Twins’ enigmatic persona, The Jesus and Mary Chain’s white-knuckle grip on noise, and the nimble theatricality of Echo & The Bunnymen. After meeting great acclaim with their 2016 EP Youth, the trio is readied to release their first full LP—titled Animal—on May 27. The release will mark a milestone for both the band and its label, Weyrd Son Records, which will be celebrating its 4-year anniversary. Animal is available for preorder via Weyrd Son Records here.